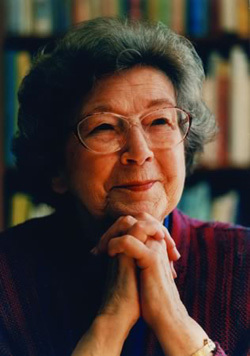 Did you know that today is my favorite children’s author Beverly Cleary’s 100th birthday? Famous and beloved for her Beezus and Ramona (and Henry Huggins and Ribsy) books, Cleary wrote about real kids and their everyday lives and strug gles with a comic touch. Never preachy, always lively and engaging, she wanted to write about ordinary kids, “grubby neighborhood kids,” as she said, and she modeled many of her stories after her children’s childhoods. She’s also written two memoirs, A Girl from Yamhill and My Own Two Feet that are as entertaining to read for adults as her children’s book are for kids. Book Riot has a fun 100 Awesome Things About Beverly Cleary on Her 100th Birthday article, too. Become a fan today-her books are delightful!